This past weekend not only did I relax and chill out to the best of my abilities (which if you read my previous post, isn’t very chill), I also made cookies. Not just any cookies, mind you, chocolate chip cookies. It’s funny because I already have 2 different chocolate chip cookie recipes that I think are tops. This one is now added to that very exclusive list. 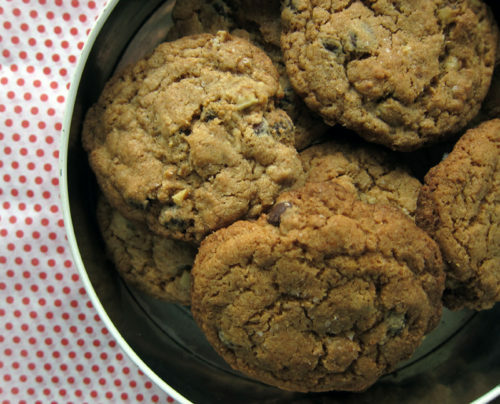 What I love about this version is that these cookies are made with whole wheat flour. They aren’t hard and dense discs that you could use as weapons. Nope. These are chewy and buttery and really incredible. You might be fooled into thinking that this is a healthy recipe – the ww flour seems to do that – but trust me, this isn’t health food. It’s buttery and decadent as all get out. The whole wheat isn’t just a side player in this recipe. It’s a standout. It parties hard along with the chocolate chips and walnuts and butter to really give these cookies specialness. Would it be odd to say that you can taste their wheatiness and that’s what helps to make these cookies so great? Well, I said it and there it is. I urge you to bake a batch of these right now. The original recipe calls for bittersweet chocolate, roughly chopped from a block, but I used semi-sweet chocolate chips and they were still amazing. I threw in walnuts as well because we are a nuts-in-cookies household. Is that a rare thing? I love how nuts help to balance out the sweetness from the chocolate. I think it’s a necessary addition but maybe you feel differently. And because I love a good salty-sweet combo, I sprinkled some salt over top before baking. It’s another thing I like to do. If you don’t want all of this temptation within arms reach, freeze the balls of cookie dough and bake them off when your sweet tooth strikes. This is a dough that ages well. elsewhere: At Poppytalk this week I showcase a recipe for Nanaimo Bars. If you haven’t had these beauts, you are seriously missing out. It’s a Canadian tradition and well worth the calorie overload. Make them for the holidays & feel the love. Preheat oven to 350F. Line 2 baking sheets with parchment & set aside. In a medium sized bowl, whisk together the flour, baking powder, baking soda and salt together. In your stand mixer, beat the cold butter until fluffy – it works surprisingly well! Add in the sugars and blend, then add in the eggs and vanilla. Slowly beat in the flour and then the chocolate chips and walnuts (if using). Use an ice cream scoop to plop these balls of dough onto your prepared cookie sheets – about 3 tablespoons per cookie is probably good. 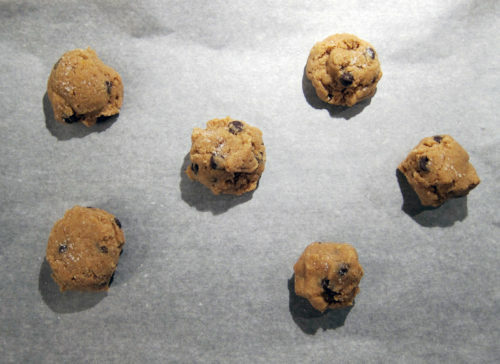 Give them room to spread, about 3″ space between each cookie. Sprinkle lightly with fleur du sel, if using. Bake for 16-20 minutes on the bottom 2 racks, rotating the pans midway so that the pan that was on the bottom goes above & the one above goes below. Remove cookies from sheets and let cool on wire racks. Store in a covered tin. Yields about 20 large cookies. Love these, especially with the sprinkle of sea salt. Whole wheat flour is difficult for me to digest, but I’d love to try a spelt/buckwheat version. My go-to chocolate chip cookies are whole wheat, too. But we call actually DO them Health Cookies because they use Sucanat (unrefined sugar), bittersweet chocolate (which has proven health benefits! ), walnuts, and cranberries. I also use coconut oil instead of butter since my kids are dairy free. See? Totally good for you! I’ve heard such great things about this recipe and it’s a darn shame that I still haven’t made them! Congrats on your Fab collaboration 🙂 You’ll be a busy gal, huh? Are you able to order from Fab, yet? I have that cookbook and yet have never made these!! I really should start baking more from it and get some more whole grains into my life! Those cookies sound good! 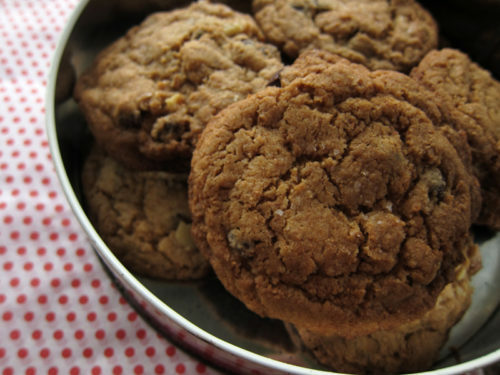 Can’t wait to try them…but just yesterday I made a batch of your garam masala cookies! My favorite, go-to cookie recipe you posted way back. I will have to hurry up and eat them all so I can make these! And the way I see it, no matter the sugar, butter and nuts, making your own cookies has still got to be healthier than store bought…right?! Ashlae, if you do try a spelt/buckwheat version, let me know how it goes! I think that would taste great! Nicole, give it a go already! I can’t believe that I waited so long too. Joanne, this is a good one! It’s a great book and it’s time to cook more from it to. I don’t think I’ve ever tasted whole wheat chocolate chip cookies before. I love cookies so I will certainly be making these as soon as I pick up a block of butter, something I keep forgetting to do. On my way to check out fab.com now. Ah, you missed it Bijoux, the sale ended at 11am EST this morning. Anyway, these cookies are really freakin’ delicious. I’m sure you’ll love them. That would explain why I couldn’t find your cards after searching for them non-stop. I was starting to doubt my internet search abilities. That’s ok. I can still find you easily on Etsy 🙂 Cookies….mmm! I made these for a client, and for my poker buddies; everyone loved them. They’re tender, and the whole wheat imparts a “fuller” flavor. I actually didn’t know you could bake anything with 100% whole wheat (other than bread) and make an edible product. 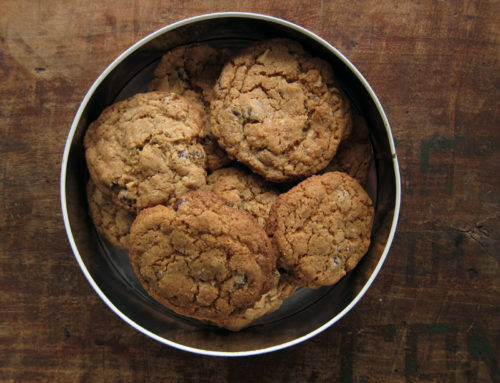 Growing up, my mom always made our chocolate-chip cookies with half whole-wheat flour, half white. I do a lot of baking that way – I love the toothsome quality that ww flour imparts, but sometimes I’m not willing to go whole hog. I will have to try these, though! Bijoux, no worries!! And make these cookies – you’ll love ’em! Robert F, I know, it’s a surprising revelation that these work out so well. Glad you liked them. Emily, I do a lot of baking that way too – I’ve got a half ap/ half ww cranberry loaf in the oven right now. These ones are really different though – the flour adds a lot of flavour! I think you’d like these! Connie, definitely 🙂 I can go along with that! Totally amazing. Surpassed my expectations! Would love to see a gluten free version of these recipes if poss.? Love the photos and the commentary to bring us in – I am being dragged along, ooh nobody there, could have sworn something is pulling – oh yes, those cookies are driving me mad!